Creating your first Workflow doesn't have to be a complicated process. 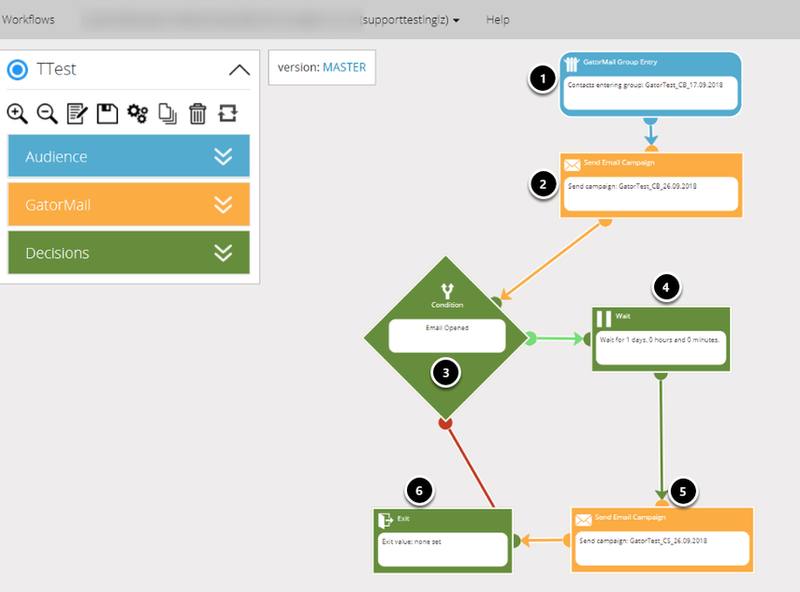 Our Drag & Drop Editor makes visualisation of your campaign-audience interactions simple and easy to manage. This article will take you through the creation of a Workflow from start to finish without the use of a pre-made template. This will launch you into the Workflow canvas. The first action we recommend you taking is changing the basic settings of the Workflow. This allows you to focus on the creation rather than smaller details if this is completed first. 1. Select the 'Edit Settings' icon. 2. Enter a 'Test Email Address'. Usually this would be the email of the individual who has created the Workflow. 3. Select whether you wish to de-dupe the audience members using their email address. This means that contact can only pass through the workflow once. It will not be allowed through again. 4. Select whether you wish for unsent GatorMail campaign emails to be removed when an audience member is removed or the Workflow completes. If a campaign has follow up rules or notifications then these will no longer be sent from the campaign stage. 5. Edit the Start & End Date of the Workflow. Once it starts members will be sent emails and move through the Workflow. All activity stops when the End Date is reached. Before you start dragging blocks onto the screen we recommend you have all of your email campaigns and groups created so the Workflow creation is smooth and efficient. Drafting on paper your ideas for the Workflow will help you create a cleaner design. If you try to imagine the journey you wish audience members to take you can translate that into the Workflow canvas effectively. In this Workflow we want to send two email campaigns, but we only want people who have opened the first email to receive a second email. 1. So we start with a Group you have made for this workflow, or a Group from another workflow that you want to receive this campaign as well. 2. We then send them the first email. 3. Here is a condition. The condition has a positive (green) and negative (red) route, which can be seen as a "Yes" or "No" route. 4. If the condition of the email being opened is met, the audience members travel along the positive route and have to wait for a day. 5. After the wait period of a day, they are sent a second email campaign. 6. If they do not meet the condition and haven't opened the email they immediately exit the Workflow. 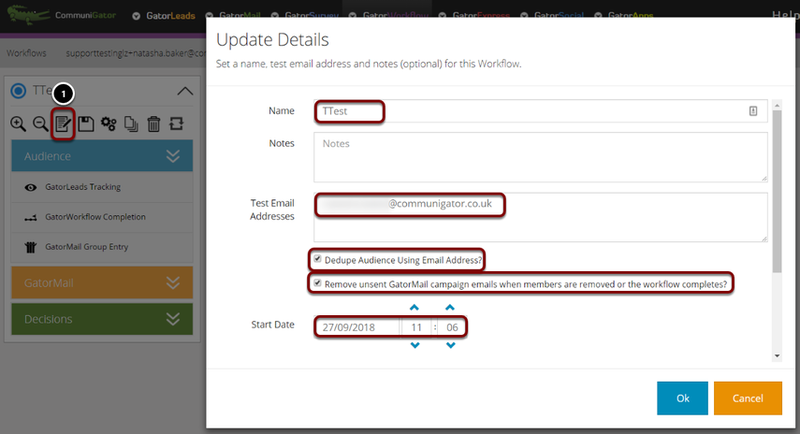 After the group who met the condition have been sent the second email campaign they also exit the Workflow. Within this Workflow we have an Audience stage, two GatorMail stages, and three Decision stages. With each GatorMail stage a Decision stage comes before or after it. 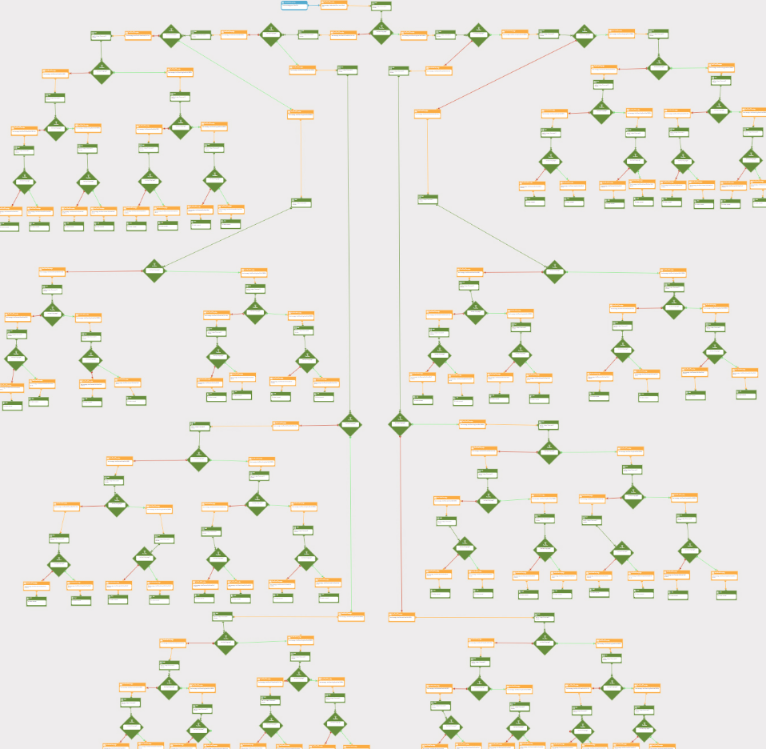 But this is only a simple Workflow. With more email campaigns you want to send you will need more Decision stages and potentially more Audience stages. The above Workflow is more complex than the first but is still simple to create. 1. In this Workflow there are three entry points for audience members. Two of them are Groups, and the third is a GatorWorkflow Completion entry. This enters people into the Workflow from another Workflow of your choosing. 2. They are sent two separate email campaigns. 3. After they have been sent these emails they have to go through separate condition stages. The first being whether they have downloaded a document that was within the email they were sent. The second being whether they opened the email. For the condition on the right of the Workflow, if they do not open the email they get sent the email that the first two groups were sent, and travel along that path of the Workflow. 4. If they do not meet the first condition they are sent a different email campaign then exit the Workflow. 5. If they do meet the conditions then they are added to separate groups. 6. They then exit the Workflow. 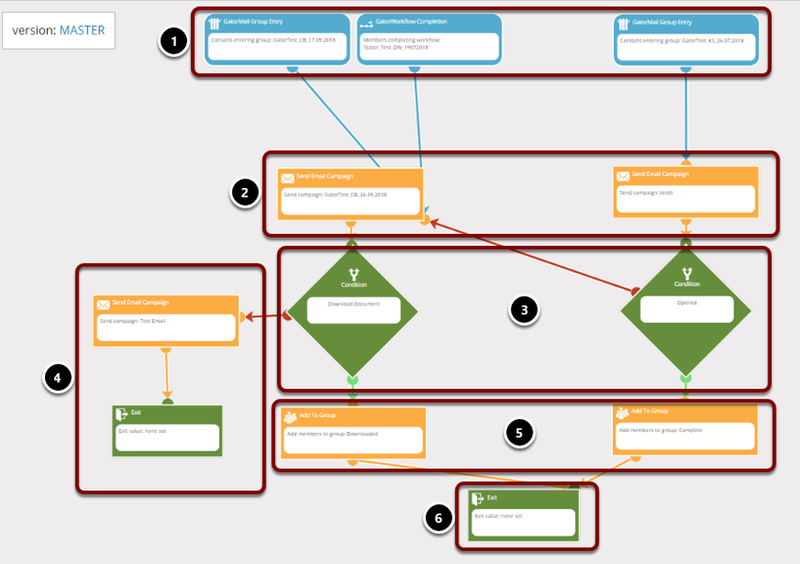 The above Workflow shows the vast canvas space and immense capabilities of the product. Whilst the Workflow above appears highly complicated, it is simply sending of email campaigns to varying audience groups who meet certain conditions. Now your design has been created and your groups and emails added, we need to do some final checks. 1. First check that wait conditions have been added where necessary. We recommend using wait conditions between sending emails so members aren't bombarded with communications. 2. Ensure you have saved your work, but we recommend you save frequently to avoid losing your work. To learn more about saving your Workflow, please read the following article. 3. Make sure you have tested your Workflow. ALWAYS test your Workflow to make sure your conditions and rules work. To learn more about testing your Workflow, please read the following article. 4. Once you have tested your Workflow and all the details are correct, you can change the state from Testing to Live. To learn more about publishing your Workflow, please read the following article.